The 2018 Dodge Durango R/T. Being a child of the 60s and 70s, who was old enough to have posters on the wall during what we thought was the Golden Age of Muscle Cars, only to have the party end thanks to emissions regulations, insurance surcharges and Arab oil embargoes just as I got my license, I just have to love Dodge. With the exception of the sad-sack Journey and the pre-historic Grand Caravan (which we liked---in 2010), Dodge is just one big toy store, full of things that any red-blooded American boy or girl could use to have fun, cause mayhem and lose one's driver license. 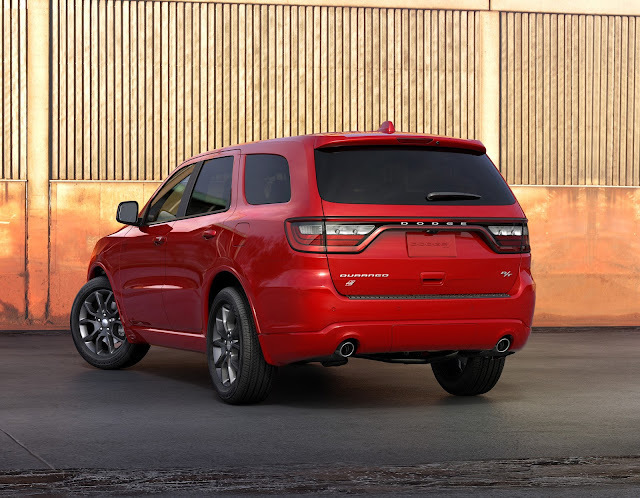 The very description of the 2018 Dodge Durango R/T is pure go-fast American ingenuity and hot-roddery: Take a Jeep Grand Cherokee, stretch the wheelbase to make three rows of seats go in easier and stuff a 5.7-liter, 360 horsepower Hemi V8 under the hood. 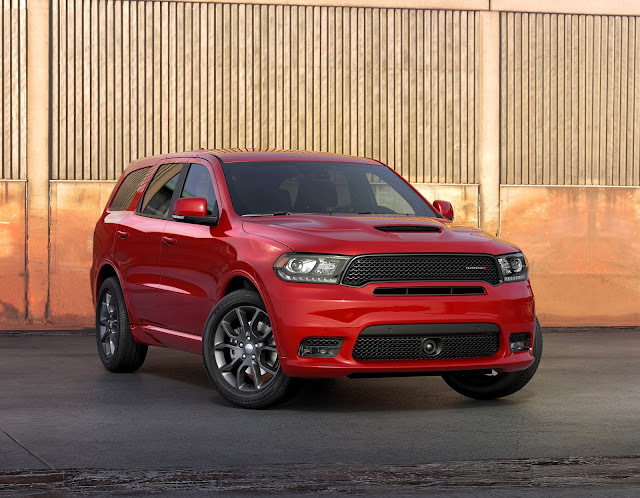 Connect it to an eight-speed automatic transmission to keep fuel economy from looking like the 60s Hemis (EPA fuel economy estimate for the 2018 Dodge Durango R/T AWD is 14 city/22 highway) and you've got something. It's the SUV enthusiast dads and moms will buy first when the family finally demands all that seating capacity. 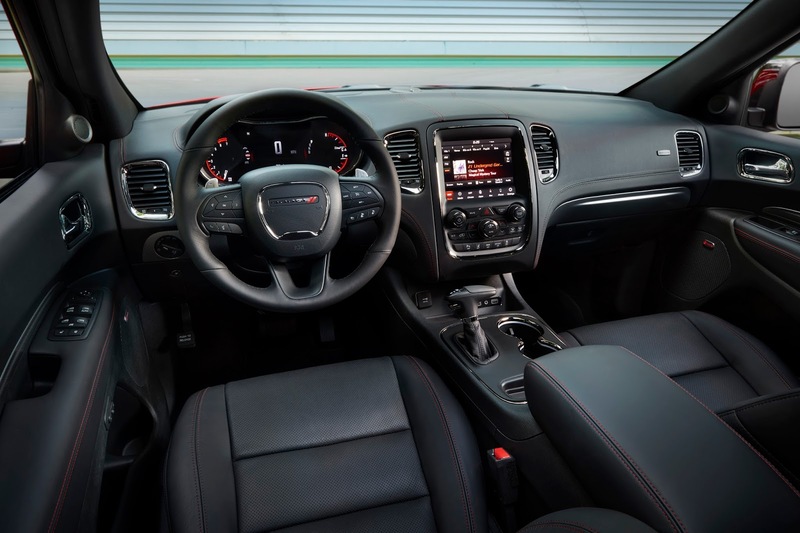 Our experience: The Hemi means business. Put your foot on the right pedal and speed happens right away. And the 2018 Dodge Durango R/T can back it up with stopping and handling abilities not found in most SUVs. Front and rear parking assist with stop. Anti-lock four-wheel heavy duty disc brakes. Uconnect navigationwith an 8.4-inch display. Two USB jacks and one AUX jack. Perforated leather-wrapped heated steering wheel. Power 8-way front seats (memory for driver's seat). Power driver and passenger 4-way lumbar adjustment. Second-row 60/40 fold and tumble seat. One-year subscription to SiriusXM Satellite Radio. 5-year subscription to SiriusXM Travel Link. One-year subscription to SiriusXM Guardian service. Dual rear exhaust with bright tips. Now, that $46,295 looks like a pretty good value. 2018 Dodge Durango R/T interior. Technology Group (Adaptive cruise control with stop, advanced brake assist, blind spot and cross-path detection, full-speed forward collision warning and lane departure warning): $2,495. Rear DVD Entertainment Center (a Blu-Ray compatible dual screen video system): $1,995. Trailer Tow Group (7-pin and 4-pin wiring harness and a Class IV receiver hitch): $995. Second-row fold-and-tumble captain's chairs: $995. Second-row console with armrest and storage, including a USB port and 12-volt auxilary power outlet in the console, a third-row full console floor mat and illuminated rear cupholders: $495. Hand-wrapped dashboard with LiveStitch: $995. With $995 destination charges, it all rings in at $56,555. We've driven similarly-sized SUVs for roughly the same money that didn't put as big a grin on our face or shove in our back when we pressed the accelerator. The Durango is good, clean fun.